You may have seen these on ebay. I decided to have a go and ordered one. It arrived very quickly. I also ordered a different one which has not arrived yet. In addition there are lengths of steel and brass wire. What there aren't is instructions and 3d printed parts shown in the Ebay llsting. 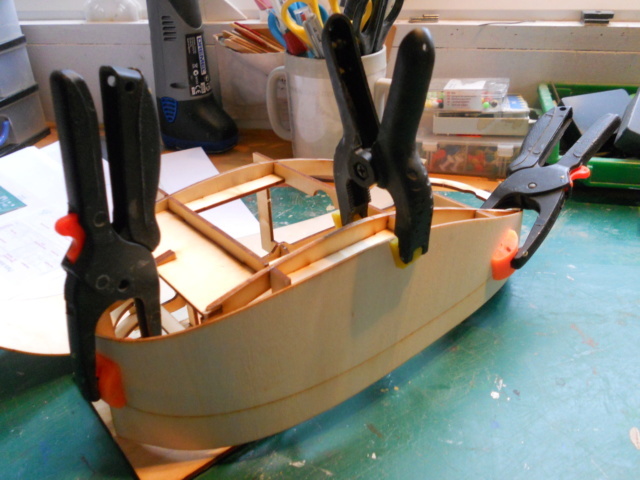 I am not too bothered about the latter, but without instructions its more of a jigsaw puzzle than boat kit. I have been promised instructions from someone in the USA, and the seller has sent me a link. oh i've seen these scurrying about ebay once or twice, thought they looked great for a small project! yes, me two...…….fancied buying a couple a while ago to accompany that ferry I built...…….if I can't get the thing sailing straight, at least I can tow the sod and keep it straight that way...…..
so c'mon, barrie get building and soon. 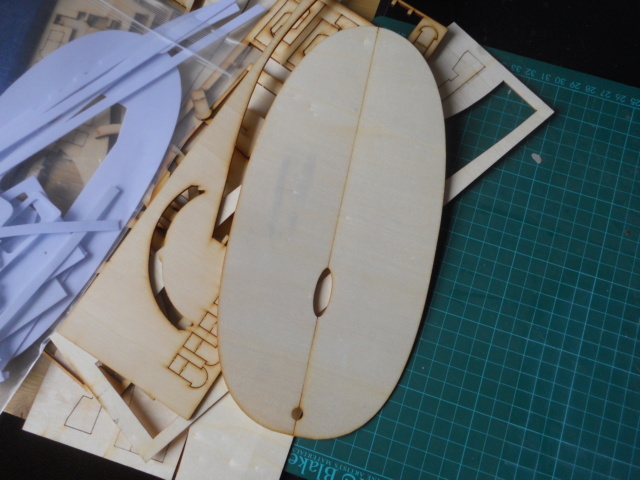 The quality of the laser cut ply and CNC plastic is quite good. The plastic will need the edges cleaning, but otherwise looks good. if you are interested there is a build of this boat on rc groups.com. 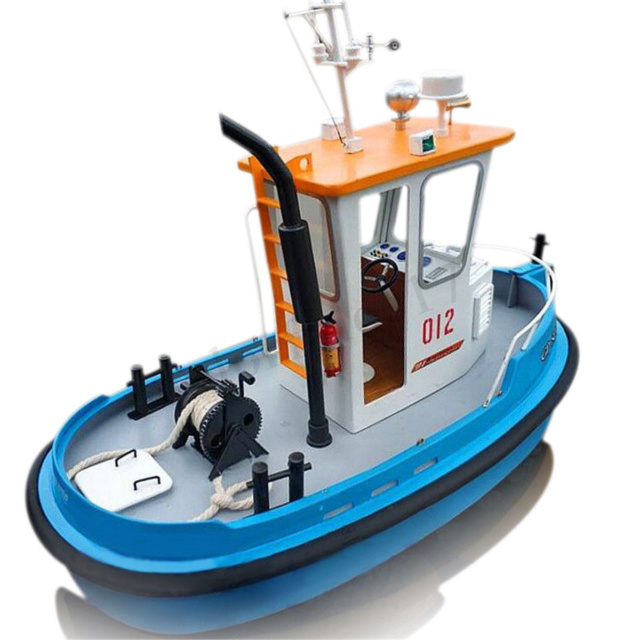 the guy who has built it is called keith s . the title of the build is Q2 1/18 mini tug boat. it looks very small and fiddley to me hope you enjoy it and all works out . sorry as you no I cant do links but it is there. Thanks David. If I get stuck I'll look for it. No Dave - it will sail. Reading that it is obvious that there are various versions of this around, with varying degrees of kit completeness. I'm not sure how you select the seller that supplies the genuine article. They are all about the same price, and it appears from that blog that the same seller may supply two different versions. I selected my seller because it claimed to be UK shipped, although I worked out he was drop shipping. At least that way I thought I would avoid any chance of Duty. As I said, I am not too worried about the missing pieces, and I should have some instructions by tomorrow. The instructions have arrived - obviously from the original kit. 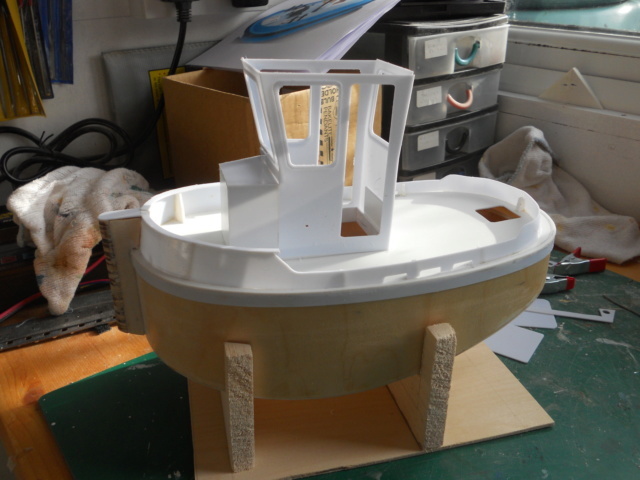 The hull framework is now glues ready for sanding the frames then fitting the skins. I'm not sure if I dare wet or steam the skins as I am not sure of the quality of the ply. I may try a little heat. 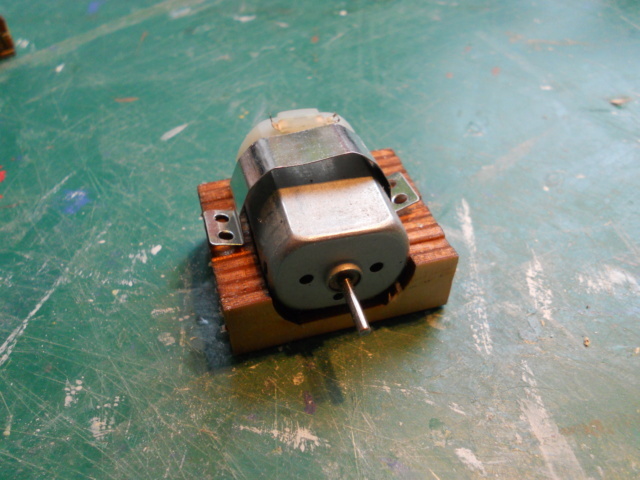 I tested the little motor and it runs sweetly. On no load it draws very little current, less than half an amp. I need to buy an ESC and a propshaft and prop. Too small for my eyes I'm afraid. I don't have any suitable material in stock. I did cut a new side from 0.8 mm ply, but the grain is the wrong way and I don't think it will do. 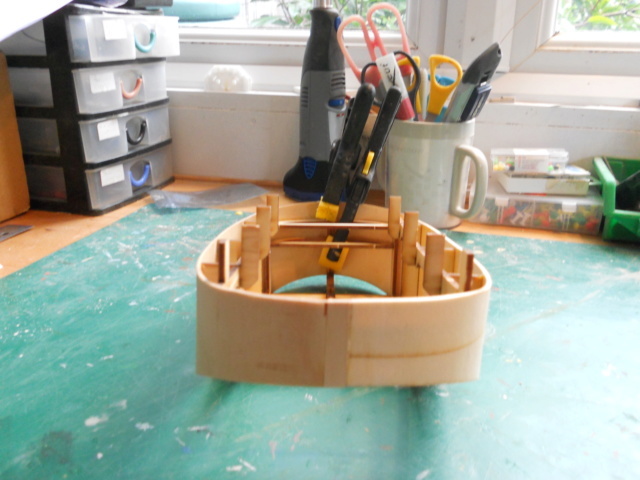 I have glued the broken piece together, but doubt it will be strong enough. So two solutions - go and buy a suitable piece of ply or use plasticard. At the moment I am favouring the latter as I have the material in stock. I made up the bow post - that's what all those mushrooms were for, and also the motor mount. There is a servo mount but I am not sure what sort of servo is supposed to fit it. I've just ordered a prop shaft and prop. 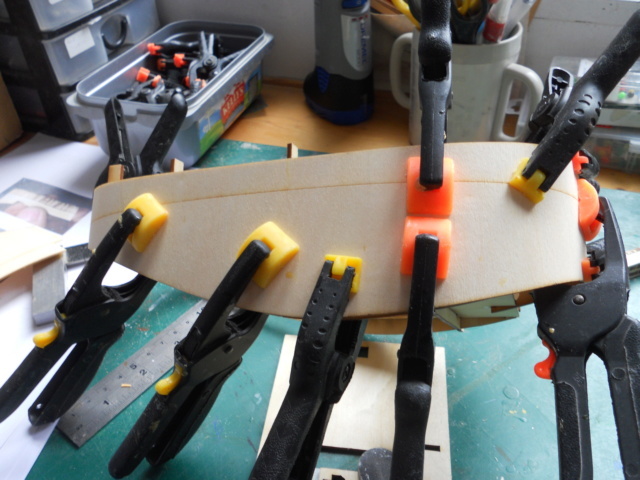 I am going with a third solution - 1.5 mm ply but only 12 in wide. That will leave a gap at the stern which I will fill in. 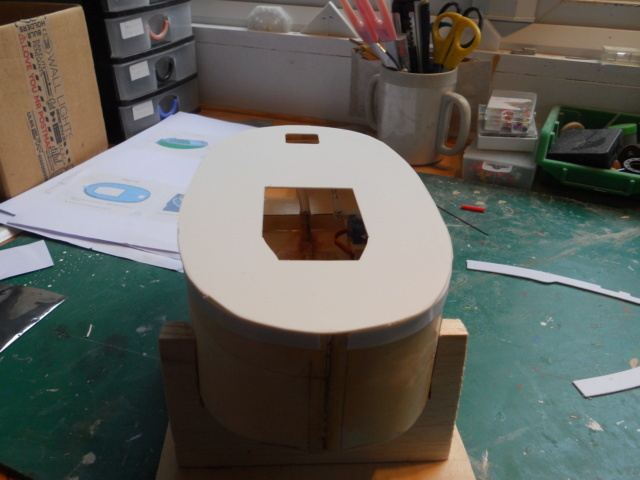 The ply I am using is much more flexible that that supplied, so I think it will be OK. The ESC, servo and prop shaft came today. 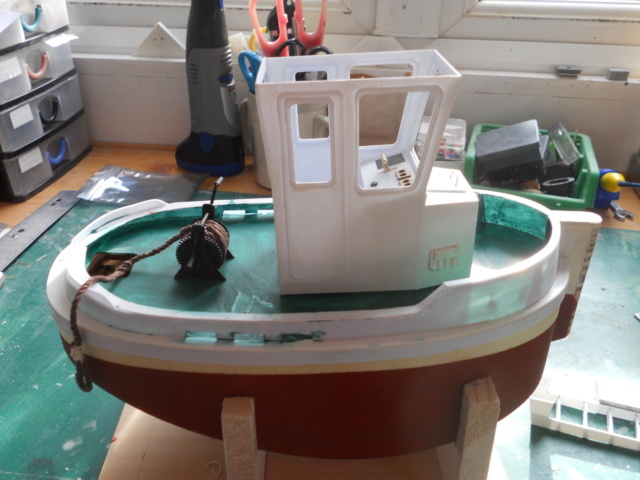 I have been sorting out brass and plastic tubing as the original of these tugs had a 3d printed fitting to take the prop shaft and create a skeg. 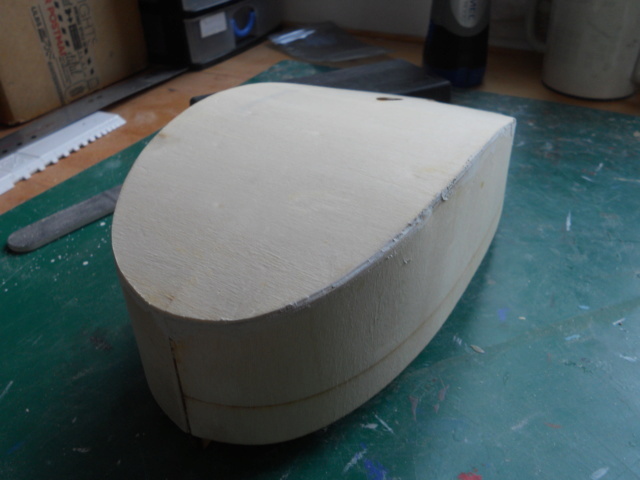 This means that the hole which is cut into the hull bottom is too large for my slimline shaft. 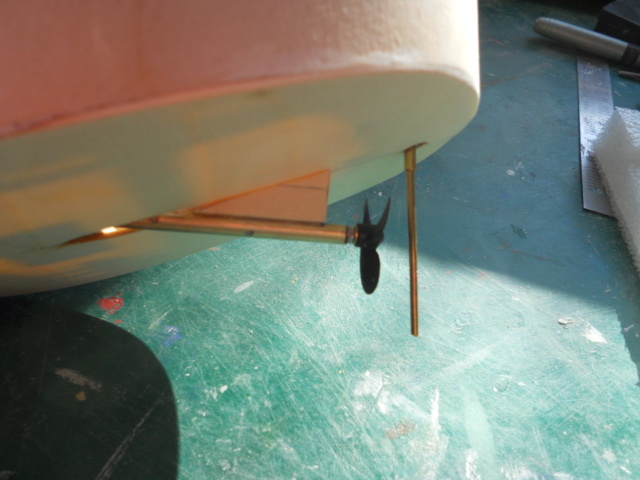 Similarly the rudder tube - the hole is quite large so will need adjustment. 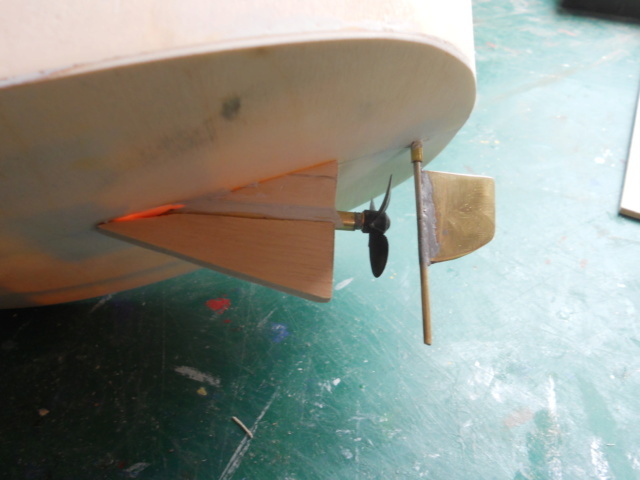 There is a plastic rudder blank in the kit, but I think I will make a brass one. Side one stuck firmly Now for side 2. 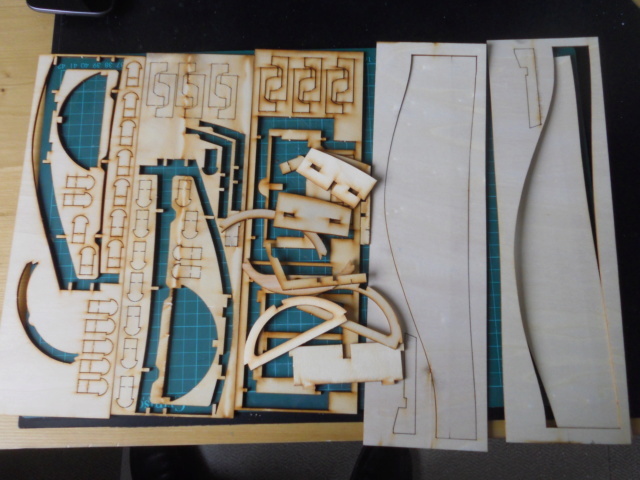 This is cut from quality 1.5 mm birch ply. After steaming for a few minutes it fitted well. I stuck it with aliphatic without waiting for it to dry completely. and its is now stuck except for the bows which are under the most stress. I must have cut the side slightly over size, so some sanding will be required. I patched the gap at the stern and this should blend in nicely. 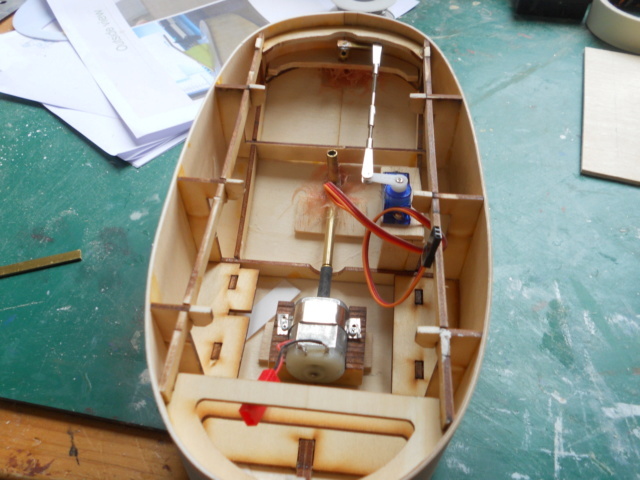 Tomorrow I plan to stick on the hull bottom and that will then allow me to move onto the motor, prop shaft servo etc. After adjusting the sides, the hull bottom was stuck down. Not a very good fit I'm afraid. I will have to strengthen the joint on the inside. That and a coat of resin inside will be the next jobs I think. I also want to fit an oiler to the prop shaft as it will exit be below the water line and so will need to be kept greased. Clamps removed and the bottom didn't drop off There looked to be one or two gaps so I set out to seal the inside with resin - except it had gone off . So Plan B - use EzeKote and some tissue to seal all the joints i could get at. Also brushed EzeKote over most of the inside. The I filled the outside. Next the prop shaft. I think this is too long, but its a bit difficult to size it up. Its not a problem as the bushes in the prop shaft will push out easily and go back when I've cut the tube. I did manage to fit an oiler tube ready to pump in some grease. The propshaft is now installed. I didn't shorten the tube as I had forgotten that it was drilled out to take the bush. I have shortened the shaft. Fitting was tricky trying to line everything up, but I think it is OK now. I have secured it inside with some P40 (after taking the photo) and the bottom part of the skeg is next job. The rudder tube is in place, again secured with P40. 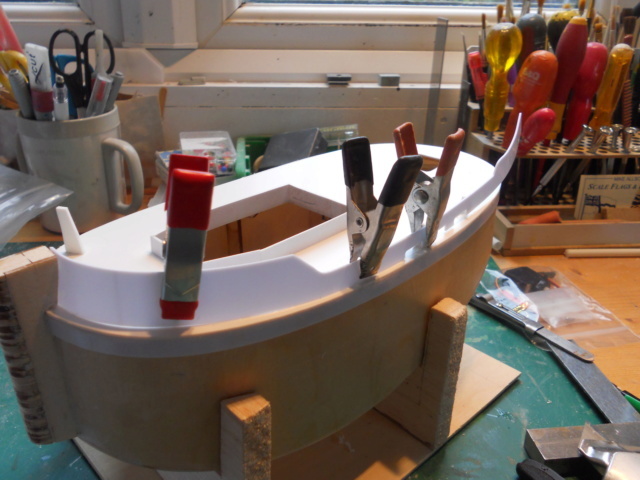 Just got to make the rudder now . I hve sorted out the motor mount and this will be fixed soon. I will be using a rubber tube coupling. Looking at that last photo, I realise that I should have cut off the head of the stem to leave a completely flat area for the deck . 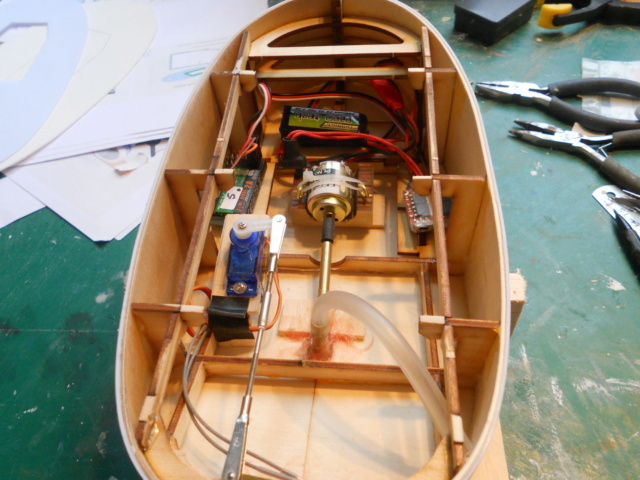 I now have a servo mount and also a rudder. The latter needs cleaning up. 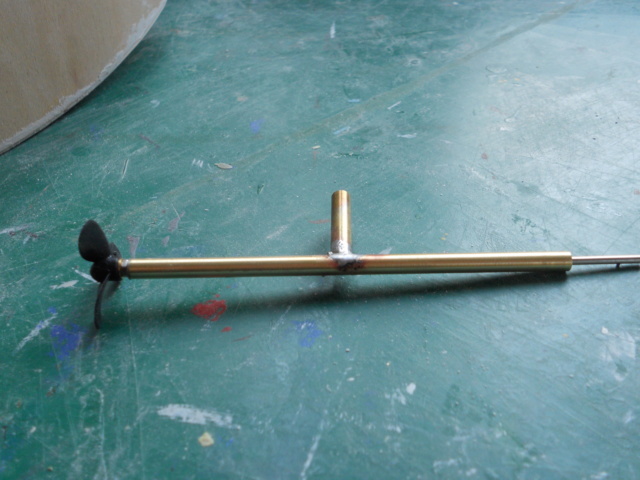 I also made a tiller. 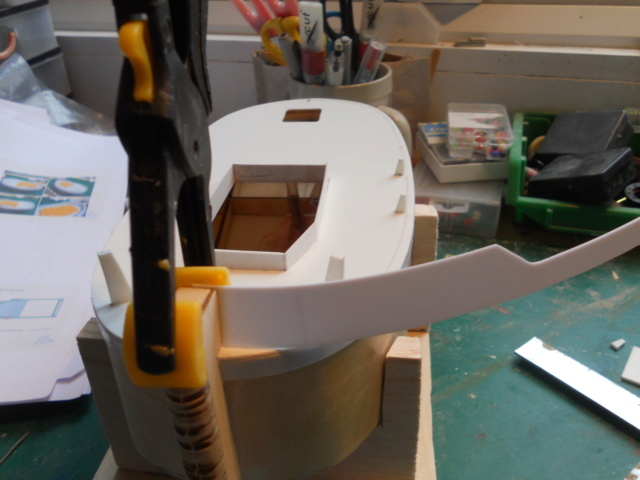 I need to decide if the rudder requires a bottom support. 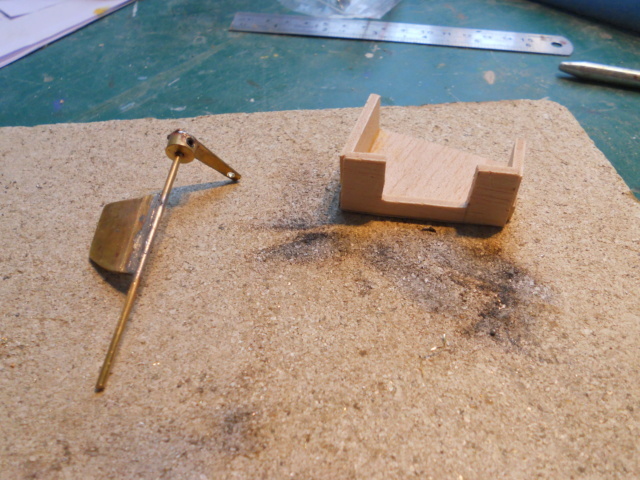 If so I will add a lower skeg to hold some brass strip to hold the bottom of the rod. 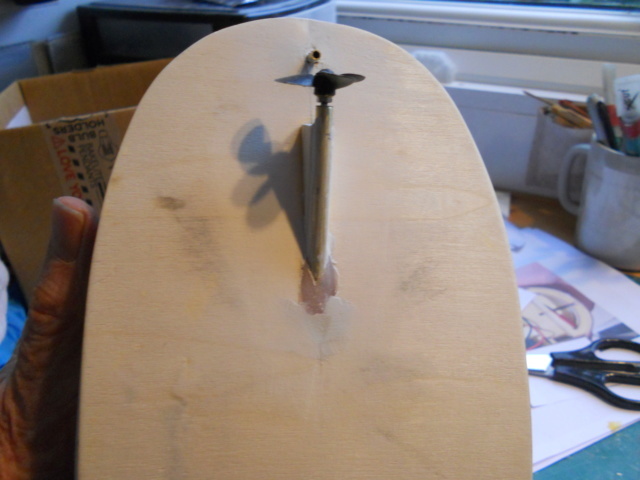 Rudder now installed - rod to be trimmed when I have made and fixed a lower support . 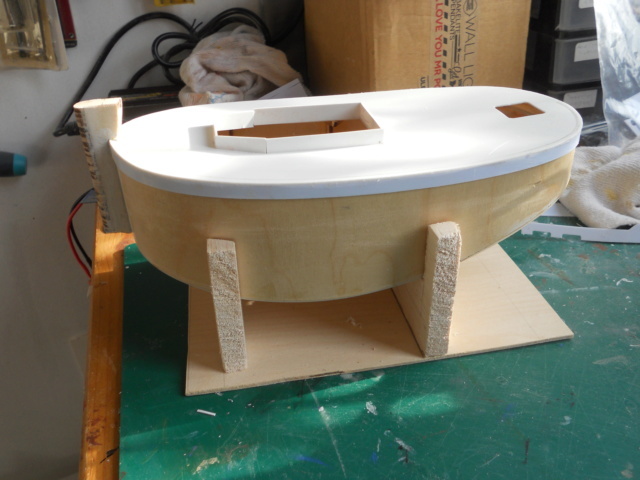 the lower skeg has been fitted, waiting for some filler. 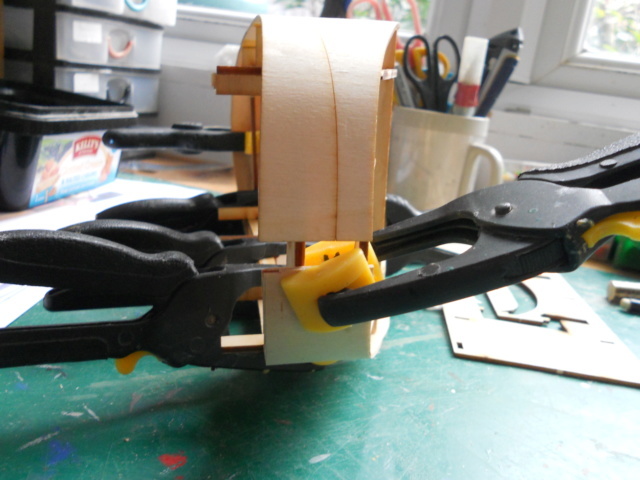 I have also installed the servo and linkage, and glued the motor in place. I wasted quite a bit of time trying to bind a new Rx before abandoning it in favour of one I know works . Having tried out the motor in situ, I'm not sure it is going to be powerful enough. There seems to be a lot of resistance on the prop shaft maybe I will change it for a 140 size. 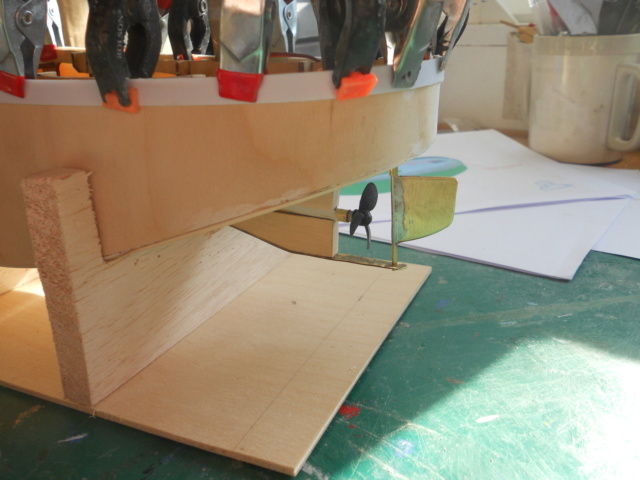 I also made a very crude stand from some scrap balsa - all my suitable ply has been consumed in making bits for my Grandson's finger skate park. 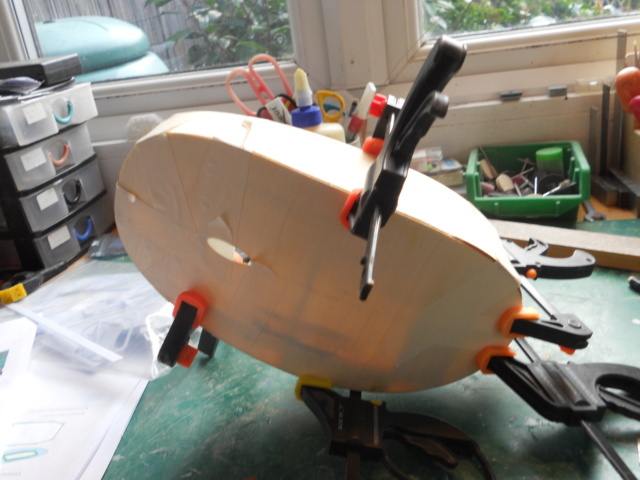 Finally I test fitted one of the strips meant to simulate the extra strengthening round the top of the hull. I'm undecided what to use to stick this - super glue or epoxy? Its plastic onto wood. Once painted I will add some half round foam rubber. 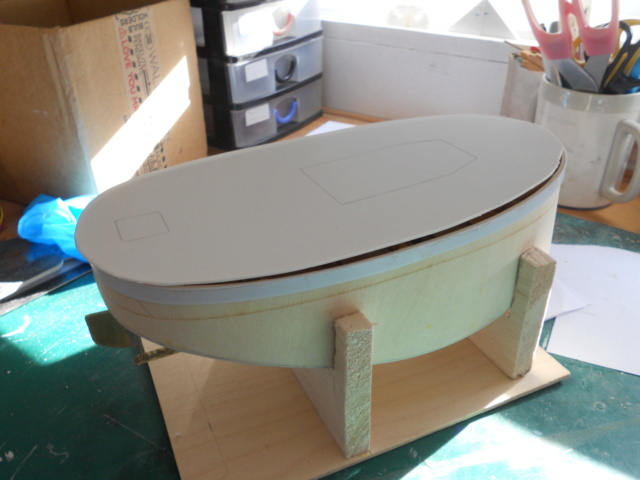 I have also worked out that the deck fits inside the hull sides. I think I have also worked out that the laser line is the waterline. Be a devil and fit a proper motor in it a 500 then it will defo be powerful enough.....you don't drive a Ferrari flat out do you...MMMMM on second thoughts put a 600 in it !!!!!!!!!! 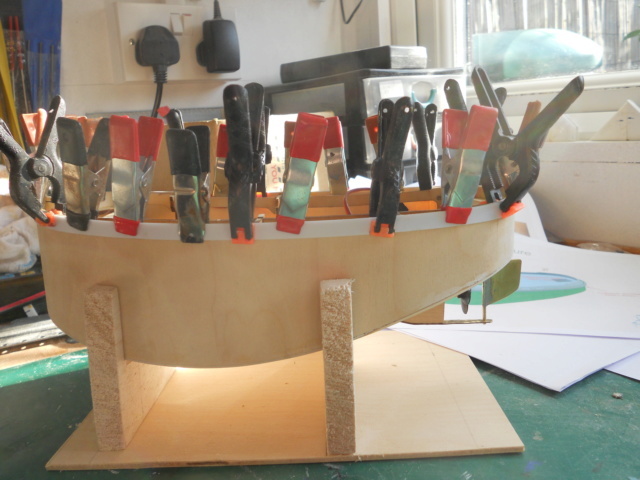 I've a few 500 derivatives barrie……….i'll send you one FOC if you want...…..i'm amazed at the amount of space in it for a tiny boat......looks great too. 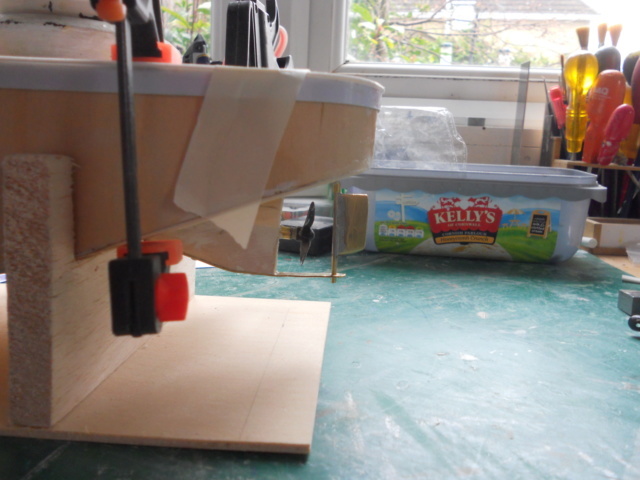 I made and fitted a bottom support for the rudder and also fitted the plastic stiffening round the top edge of the hull. 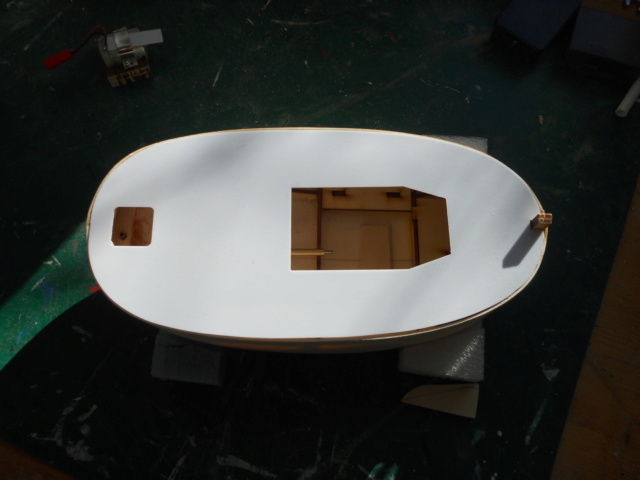 The hull is now ready for a coat of Ezekote. Thinking about the deck, I decided it should go on the top of the hull sides. If it goes inside there is nothing to support the edges . 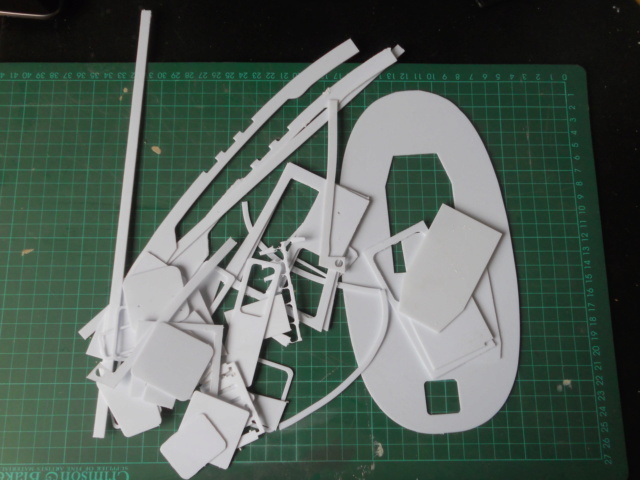 So I have cut a new piece from 1 mm plasticard. Very impressed so far with this little kit. I may actually pick one up and stick it in my to do pile! RR - in my version the wooden parts were excellent. I have just started looking at the plastic parts, and they are not quite so good. They appear to have been cut with router which has left a fuzzy edge to most of the parts, and on some it has obviously overheated leaving melted plastic on some cuts. Not disastrous, but will require a lot of work cleaning the edges. If you can find a supplier who includes the 3d printed parts, then its certainly worth the money - less than £40 from most ebay sellers. I am quite happy with my version. 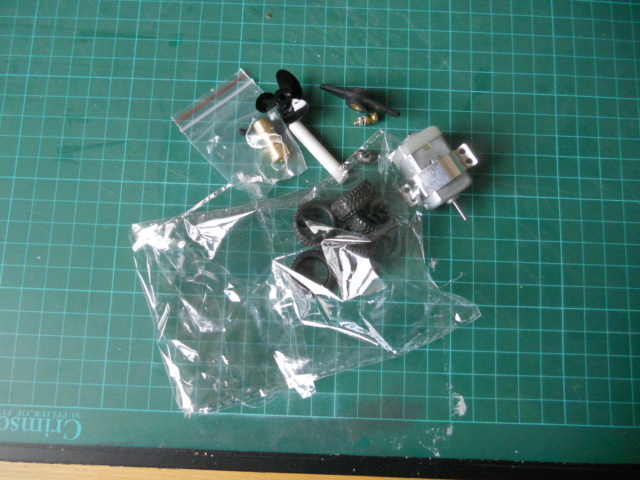 The 3d parts would have been nice, but not too difficult to replace with suitable items. 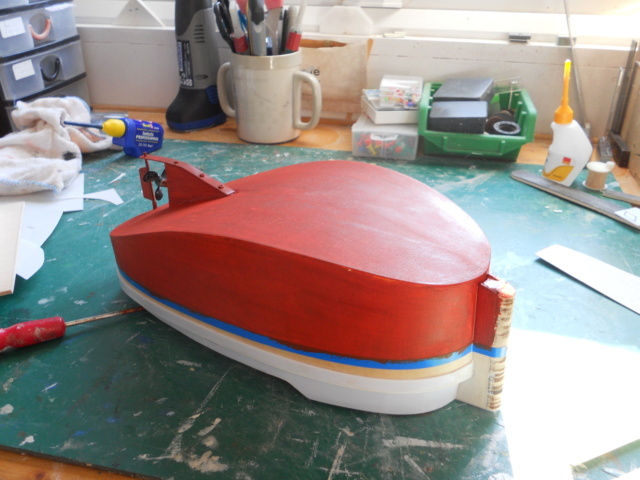 The outside of the hull has had a couple of coats of Ezekote resin. The openings have been cut in the new deck and this is ready for gluing once I have sorted out the switch mounting. I bought something similar, it was the "Sea Imp"
Your's looks much more complete, and better quality than mine! It will be interesting to watch yours get to the pond. Mine has turned into a scratch build! MickyK there is a certain amount of scratch building with this one too. 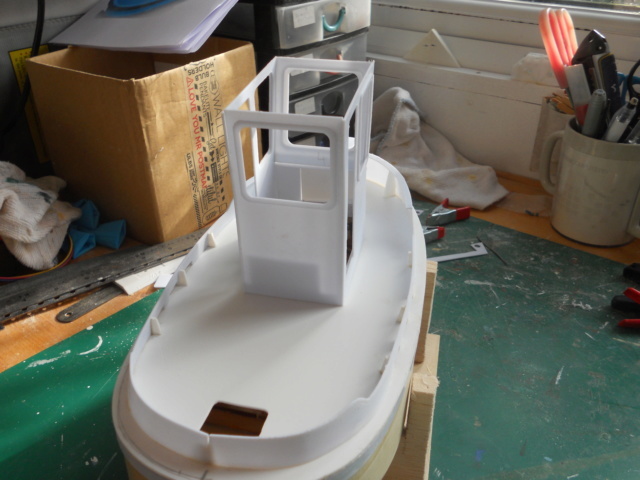 The basic hull was fine, but the plastic parts are not so good. They may need re-making when I start to put them together. Then there are no fittings so they all need making - exhaust, winch, radar etc. 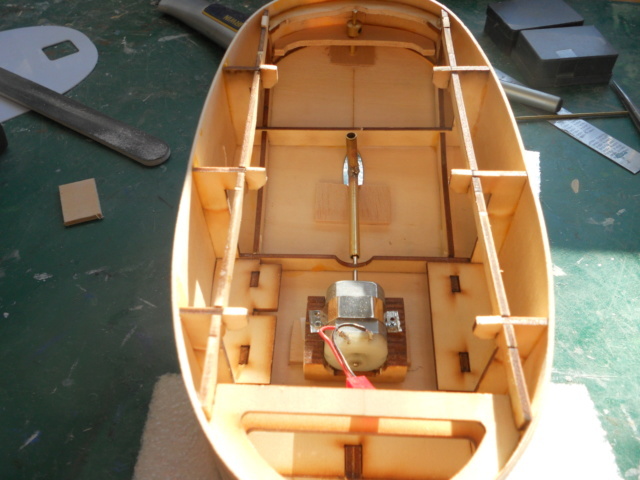 Because the 3d parts were not included, the prop shaft, skeg and rudder all had to be bought or made. Having said that, I am quite pleased with it. I knew it was gamble as to how much I would get in the kit, and I still think its quite good value for money. If you check out some of my other builds you will see that I often modify or remake parts if I am not happy with them. 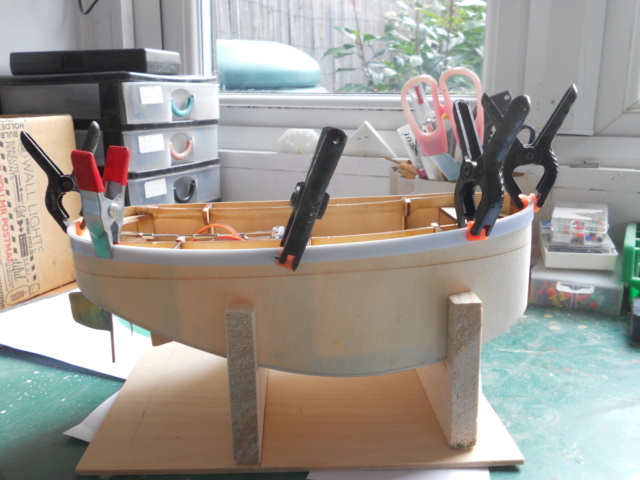 Before fixing the deck this morning I want to reduce the size of the rudder - its too fat. The 3d printed one that didn't come in the kit is very slim. I am also toying with the idea of increasing the opening in the deck and making a low hatch for the extra opening. But I'm not sure if this will weaken it too much. Watch this space. Yup clearly access is a bit of an issues but with all small boats this is usually the case, I can only suggest under deck support bracing around any new openings and combings to seal and hatch down and help with reinforcement. 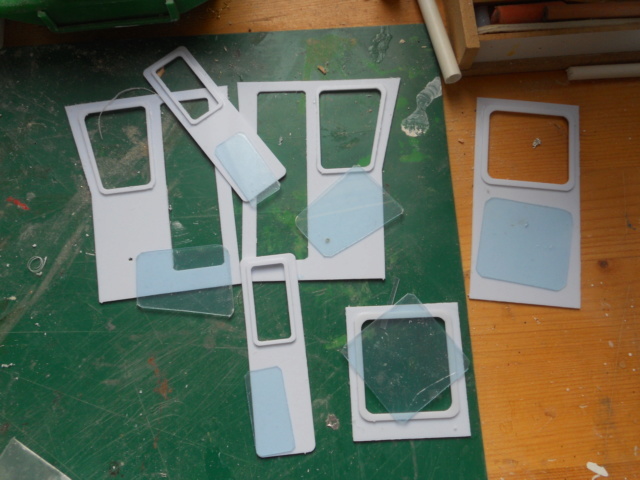 Either way given what you said about the plastic quality I see no reason to not possibly rebuild those parts in light ply, using the plastic as templates. I’ve found a version of this kit for under £30 so given my usual build style it wouldn’t remain “stock” so spending a little on some extra ply wouldn’t be the greatest waste..
RR - I decided against creating a new opening. I have added some additional strips under the existing main opening , primarily to give a better surface for the coamings. 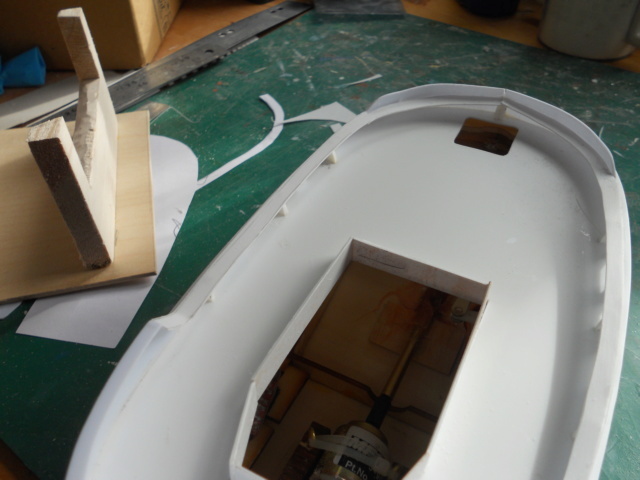 The only plastic to wood joins are the strip round the top of the hull, and the deck to the hull frame. For the first I used epoxy and it appears to have created a good bond. For the deck I have used liquid Gorilla glue, and my cunning plan is when that has set, I will seal the deck to the top of the plastic strip with liquid polystyrene . 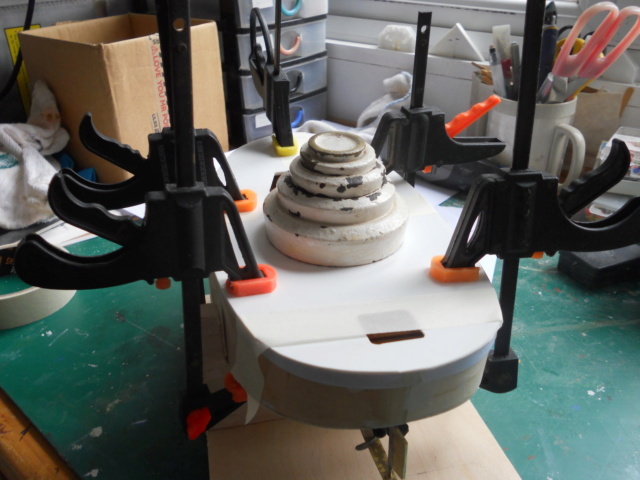 The rudder has been cut down and the switch mounted. Once the deck is stuck down and the edges trimmed it will be on to the superstructure and then painting. 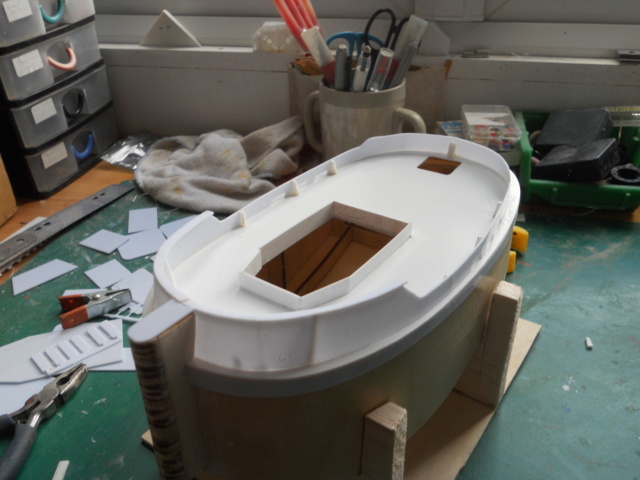 The deck edges were stuck to the plasticard round the top of the hull sides using polystyrene cement. The edges ere then trimmed. The 'bumper' was attached to the stem, and the coamings installed. 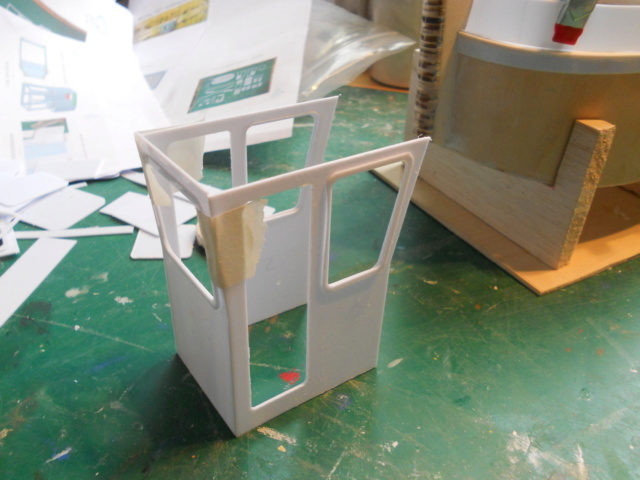 While waiting for glue to dry, I cut out windows and glued the window frames to the superstructure. After painting the windows will be installed. I think the next job is to install the bulwarks. I'm trying decide the best way to do this. There are no guides and they are glued to the deck. 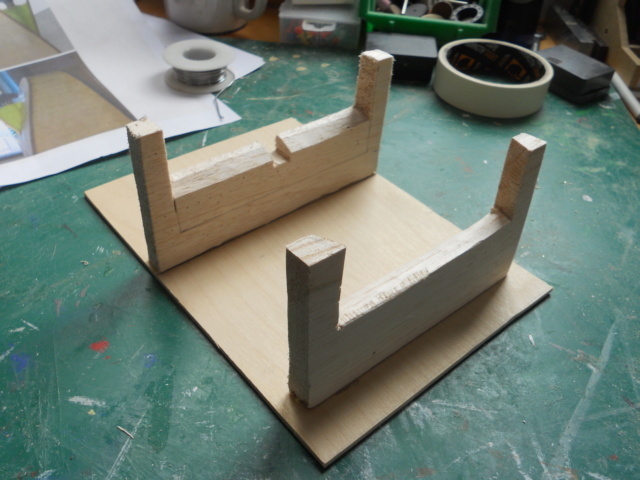 I think I need to install the bulwark supports first to give something fixed to help get the shape correct. There are some supplied, but I will probably make some more. OK - started on the bulwarks today. First problem was the supports were very badly cut and too big . So I cut some new ones from 2mm plasticard and glued them to the deck. When these had set I stuck the first side to the stem with superglue, then used liquid poly glue to fix the bulwarks to the supports and the deck. To avoid too much stress, I only went part way. Second problem, my Humbrol liquid poly wont come out of the bottle . I only bought Humbrol because the local shop didn't have Revell. Luckily there are some drops of Revell left in the bottle, and I've just ordered more. Third problem for today - they are not long enough. Not having any plans I had to guess how much to set them in from the deck edge, and used the stem as a guide. This will leave a gap at the stern which I will fill in. While waiting for the above to set, I started on the cabin. Again with no plan the first problem is identifying the parts. There are lots of bits, but not all of them appear to have a use, and some bits are missing. Missing bits are not really a problem, just frustrating when you don't have a plan to cut new ones. great job you are making of her, barrie. Thanks Neil - its an interesting build. Part kit and part scratch without any plans . The gunwales are now installed. 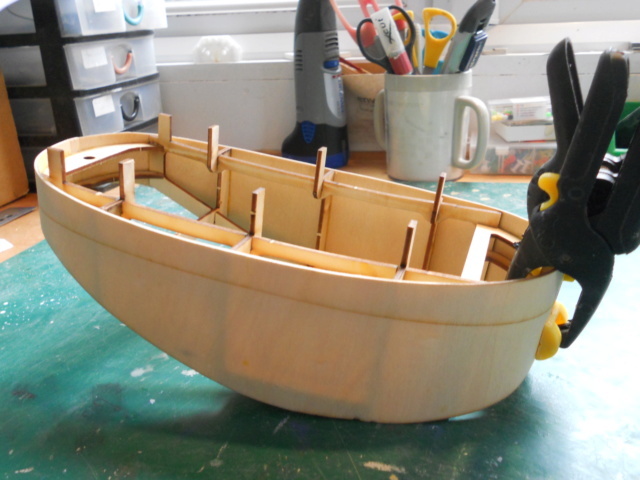 In the end they did meet at the stern I have also fitted the cappings to the bow. 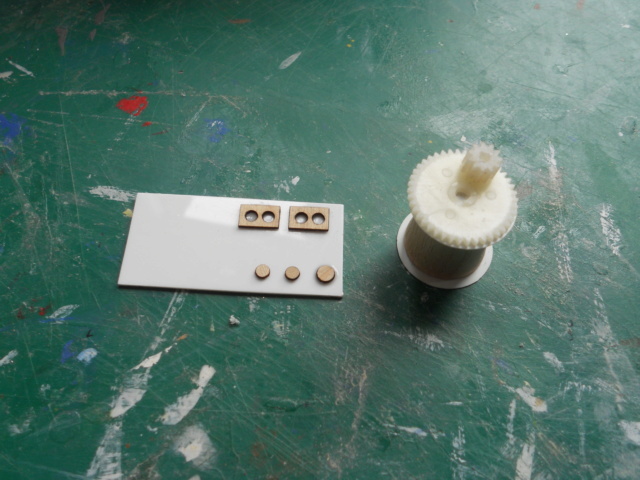 These were the only parts of the cappings in the kit. I need to decide if I am going to to try to make the remainder. The cabin is stuck together. 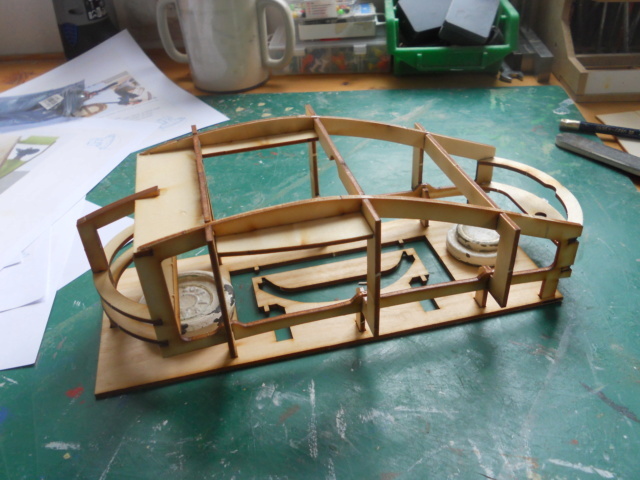 I think I will leave the roof off until I have painted the body and installed the windows. It will be much easier to do that through the top. 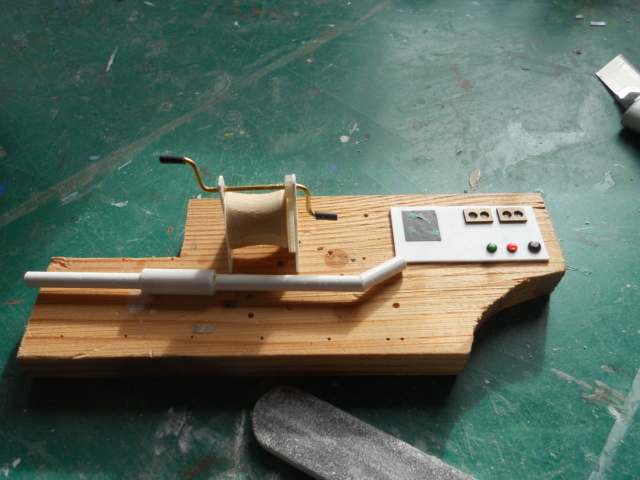 I need to clean up the edges and also make an instrument panel and find a wheel. I think that it was intended to have a floor, but I am not sure if I will fit one. The supplied cover for the rear hatch is very big so that will be replaced by a smaller one. I tried to make the cappings this morning. The Port one worked reasonably well and is now fixed in place. The Starboard one didn't and will have to be re-made . The cabin is now finished with doors fitted ready for painting. 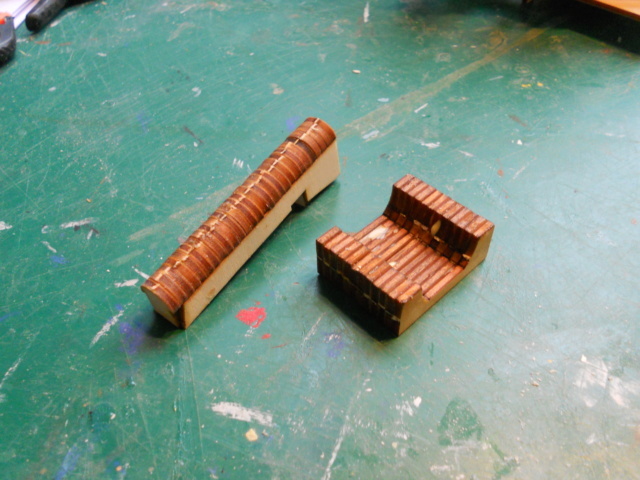 I did consider building with one door open, but have stuck them both closed I made a hatch for the front of the cabin, and the rear one over the tiller. This will be stuck down with double sided tape so that it can be removed if needed. 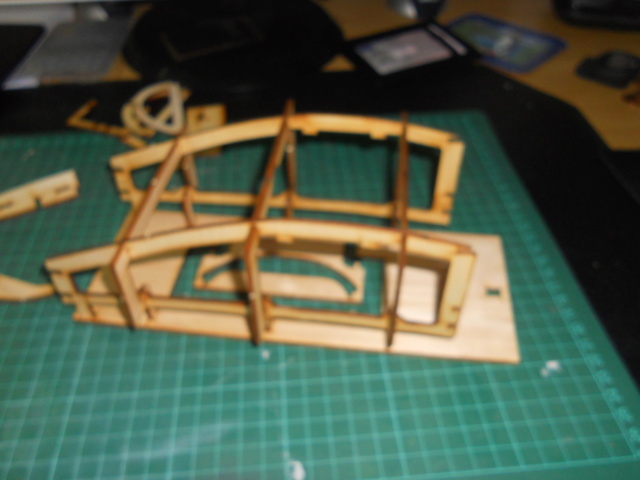 I also started on the instrument panel, and found some bits to start making a winch. I finally got the others side done - took three more tries. Not sure why this was more difficult than the port side It still needs some trimming. I then painted the underside of the hull. One coat of Red/Brown. It will need one or two more before some varnish. I also gave the cabin one coat of satin white. Then I realised I needed an exhaust pipe so went searching for suitable plastic tube. 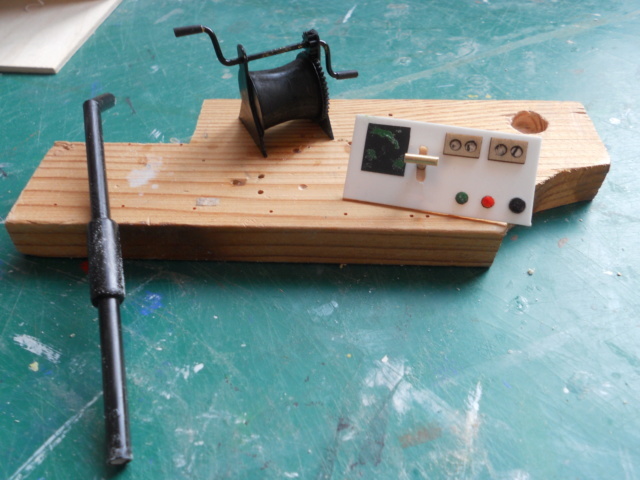 I also finished the hand winch, and added a radar display to the instrument panel, and painted the buttons etc. Need a throttle!. These two are ready for painting. 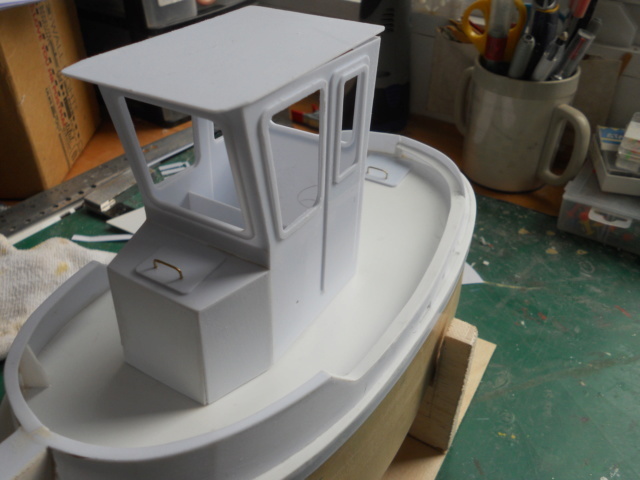 I bought some bollards so the only other fittings are for the cabin roof - radar, searchlight horn etc. The hull and cabin had second coats today. The hull will need a third I think. Its not covering very well. I painted the winch and exhaust and made a throttle for the control panel. 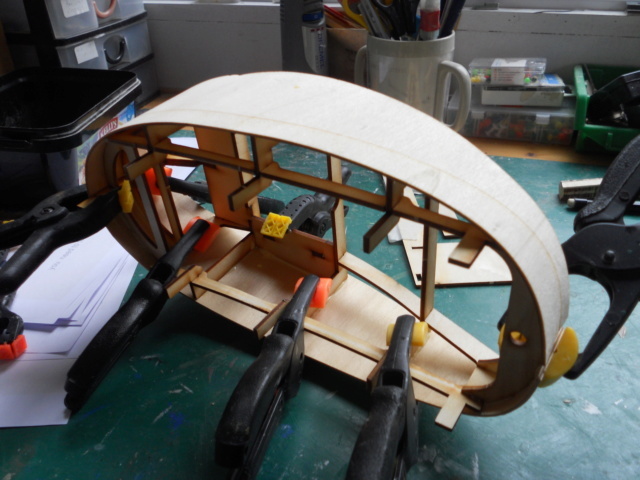 I also rooted through my bits box but didn't come up with much of use It looks as though I will have to make a wheel and the cabin roof fittings. Any tips for making a wheel David? After a third coat of paint the hull finally looks OK. I have also given the deck a first coat of green. The winch has some rope, and the control panel has been installed. 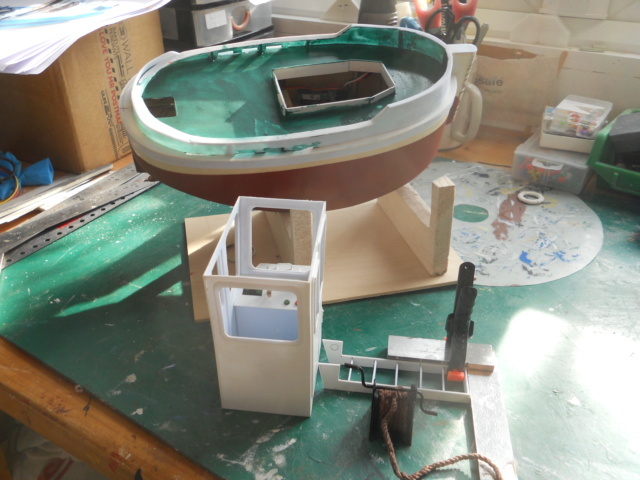 I have failed to find or make a wheel so will have to order one which will delay glazing and roof fitting on the cabin. . There is stil more painting, and I made the steps this morning after re- cutting the sides. After trying the winch on the deck, I wonder if it is a little too big? The size was determined by the gear and wood cylinder I had. it looks fine to me on the photo . have you got a figure you can stand next to it, so you can get some sort of scale, it will finish it of as well with some one stood inside cabin just a thought. does it have a scale our is it just freelance. I think the scale is supposed to be 1/18th - not one with lots of figures available. I have a couple of figures that I can try as I really would like a 'driver'. The winch will have to do as I'm not making another. I think it would look better as a power winch rather than manual, so I may try some modifications. Anyway its hairdresser run than shopping in the morning.